Fresh, high-quality concrete delivered to your job site. 4 inches is generally enough for parking areas and driveways. Depending upon traffic use, thicker sections may be required. Compacted earth may be entirely adequate as a base for residential concrete; however, where expansive clays are present a select base material should be imported. 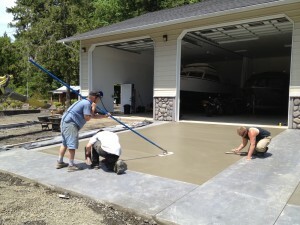 Surface of the finished slab should slope at least 1/8 inch per foot away from structures. A slope of 1/4 inch per foot is best. Be sure to take out all organic matter sludge, leaves, tree roots, wood, etc. Don’t dig deeper than you need to. Soil on which concrete is to be placed must be compacted uniformly and evenly so the slab won’t settle and won’t vary in thickness. Stake securely. See item 1-c for surface slope. Scrape loose base away from forms so edges will be at least full thickness. You can form a 4″ slab with 2×4’s. Before concrete is delivered, install pre-molded joint material wherever flatwork comes against buildings, steps, walls, existing slabs, etc. This is so the new concrete slab will be separated from the structures. Joint material must extend all the way to the bottom of the slab. Concrete placed in slabs exposed to freezing and thawing should have a minimum 28 day compressive strength of 3500 psi and have at least 5 plus or minus 1.5% entrained air. Slump should be 4 inch +/- 1 in. A slump greater than 4″ will prolong the time you have to wait before finishing, particularly in cool weather. It will also in- crease the tendency for shrinkage cracking. In addition to air entraining admixtures, chemical admixtures in conformance with ASTM C-494, may be used to accelerate, retard setting, reduce water or plasticize the concrete. Chute, wheel or shovel concrete directly to its final position. Don’t dump it in piles and then flow, drag or rake it the rest of the way. Screed (strike off) to level the surface. Immediately use wood or mag bull float to take out small high and low spots. Then, stop everything on that portion of the slab until bleed water (water sheen) disappears from surface. Immediately after all the bleed water (water sheen) is gone, joint, edge and texture as required. A broom finish is recommended – particularly on driveways, walks, and other exterior areas. Machine floating and steel troweling are not recommended for exterior surfaces. Control joints may be hand tooled or sawed. In either method, they must be cut to a depth of at least 1/4 the thickness of the slab and spaced so that the dimension either direction does not exceed that shown in the following table. Thickness of Slab / Longest Space between Joints 4 inches – 10 feet 5 inches or more – 12 feet Square sections are preferable. In any event, the length of a jointed section should not exceed 1.5 times the width. Joints usually are at much shorter intervals in public sidewalks. Most common spacing is 5 ft. Local codes or ordinances govern. Joints must be straight and continuous; not staggered or offset. When control joints are sawed, this should be done after all other finishing and curing applications are complete and as soon as the concrete has hardened sufficiently to permit sawing without raveling. Over finishing is the major cause in surface deterioration, therefore do not overwork the surface. Not only is it time consuming and expensive, but tends to bring too much fine material to the surface and weaken it. Never use a steel trowel on concrete exposed to weather. e. Curing. Apply curing as soon after final texturing as it can be done without marring the surface. Curing is one of the most important steps in concrete construction and regrettably, one of the most neglected. Effective curing is absolutely essential for surface durability. Fresh concrete must be kept warm and moist until the mixing water combines chemically with the cement (hydration). That’s what hardens the concrete and gives it its strength. Uncured concrete will have a weak surface which may deteriorate when exposed to freezing and thawing. Curing can be accomplished in a number of ways, but the simplest and most widely used method is a liquid membrane (meeting ASTM-309 standards) which is sprayed or rolled on the surface of a slab as soon as practical after finishing to prevent premature drying of the surface. This must be applied at a rate not thinner than manufacturer’s instructions. For example, many specify coverage of not more than 200 square feet per gallon (that’s twice as thick as you would apply most house paints. Water can be used when you are able to insure constant wetting for 3 days. It is absolutely essential that fresh concrete be kept from freezing for at least the first week after it is placed. Membrane curing does not keep the concrete warm enough nor does calcium chloride accelerator prevent concrete from freezing. Only adequate insulation or heating will maintain proper curing temperatures during freezing weather. Avoid any curing method that lets the surface dry in a short time. Quick drying stops the hardening process, thus making a weak surface that is likely to scale. After curing, newly placed outdoor concrete needs time to dry in warm air. Concrete placed early enough in the season so that it has one month of temperatures above 40 degrees F for curing and still another month for drying out before hard freezes are expected, has a decided advantage over concrete that has not dried out when cold weather begins. Do not use salt or other deicers during the first winter. Use sand instead to improve traction. Even light applications of salt, or salt carried on cars may cause severe scaling of newly placed concrete. Fertilizers are not an acceptable deicer at any time. Proper drainage should be maintained to avoid saturation of concrete. Sealing and Curing are not the same. Water- repellant coatings or sealers can help prevent damage from freeze/thaw cycles and salting. They deter water from getting into the surface pores. Newly cured concrete should have a period of air-drying before being sealed. Following these easy steps, concrete will provide many years of trouble-free service. I requested Josh from the recommendation from my drivers. Keep doing what you doing! Allen was great to work with! He went the right pace for me and adjusted the mud just right! Forms are off and the job looks great! © 2019 Nation's Mini-Mix, Inc. All rights reserved.